Plastic handles combine with the textured surface on the plastic blades to make this series able to cut through soft cheese or similar material while not having the material stick to the blade. They work well! See all of our Cheese knives. 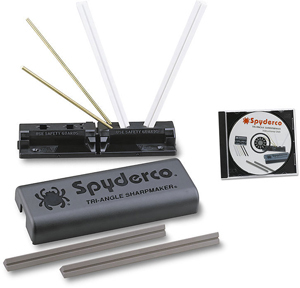 Spyderco Knives offers the UK knives that do not lock open so that they are legal in the UK. Here is the first rescue style folder that doesn’t lock. It sports an orange handle and fully serrated blade. Kershaw released some beauties that are American made and sell at great prices. One model, the Barrage, is brand new and the first one we received is with a Damascus steel blade. It is a flipper opener -and, although not assisted, it is “blur-like.” The other is one of the new ZING models but has the same Damascus steel blade. We like these very much and will have plenty of stock next week. Kyocera has a lot of great ideas. Using a ceramic mechanism for a pepper mill is absolutely one of them./ Having metal workings has never particularly appealed to me, although I considered it a necessity. The ceramic is harder than steel and works cleaner and will absolutely leave less residue on anything you grind. These are also very reasonably priced. 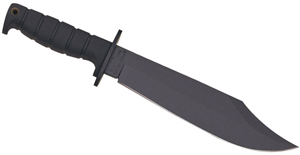 Columbia River Knife and Tool has created a veritable sword in this new combat knife- the Hisshou. It’s a thing of beauty. Columbia River Knife and Tool really is one of the most creative companies in our industry and this item really shows that. 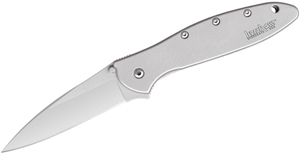 Boker Knives introduces the second in the series of fixed blades designed by Todd Begg. The Boker Kiridashi was a big hit and this Mach 2 promises to be as well. It feels great. The innovative style is a single piece of 440c stainless steel that is fitted with a piece of desert ironwood right where the handle fits into your palm. There is a slot in the steel above the wood which may lighten the knife up. The blade shape is a very popular one with a wide “knob” like end. These are made in Germany by Boker Knives.